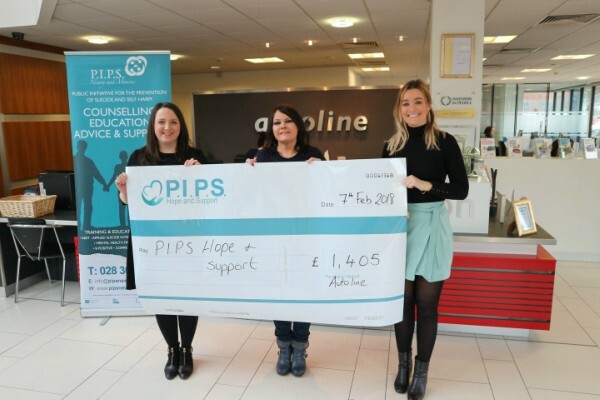 Staff and customers from Autoline Newry have raised £1,405 for PIPS Hope and Support (formerly PIPS Newry and Mourne) which supports vulnerable people and those at risk of suicidal behaviours. The money was raised last year through a range of activities organised by local branch Charity Champions, Sharon Ruddy and Roisin Cowan. Events included non-uniform days, a coffee morning, a Halloween bake off and pumpkin carving competition, and a Christmas Jumper Day. “We’re really pleased with the support our customers and friends gave us during the year to help with our fundraising campaign. This is a charity close to our hearts and was chosen by the staff in Newry. From everyone at PIPS Hope and Support - Thank You to the Staff and customers from Autoline, Newry for your support and very generous donation that will be used to help reduce the stigma of suicide and increase awareness and training in our area.